Do you like proper grammar, perfectly spelled words, and impeccable punctuation? Of course you do. That’s why you’re here, right? As a word nerd, grammar is something I immensely enjoy. Unfortunately, I find far too many unmentionable grammar crimes the minute I get on social media. 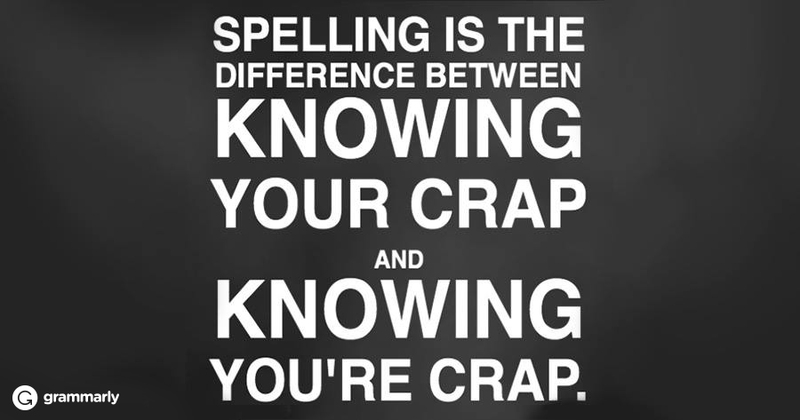 Grammar, spelling, and punctuation are always neglected in so many posts. It has made me speculate, close to tears, about the poor state of education. OK, maybe the latter description doesn’t really happen (I don’t cry and weep for the lost race of mankind after seeing a misused “their”), but I still cringe when I see just how horribly people treat language. 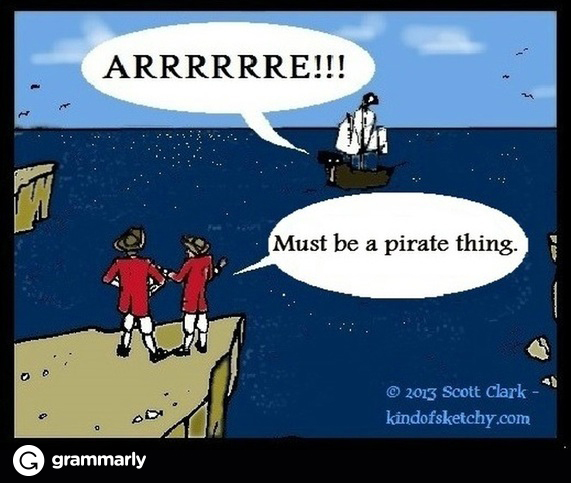 And, I’m not the only writer and grammar nerd out there who might feel this way. 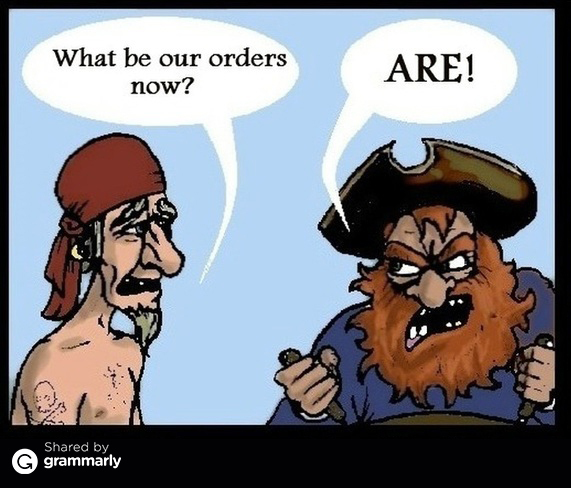 To ease the soul, sometimes I’ll turn to wordplay jokes—one of the best ways to enjoy our English language in its grammatically correct state. For those of us who absolutely adore the English language and all of its crazy nuances, wordplay grammar jokes are incredible. 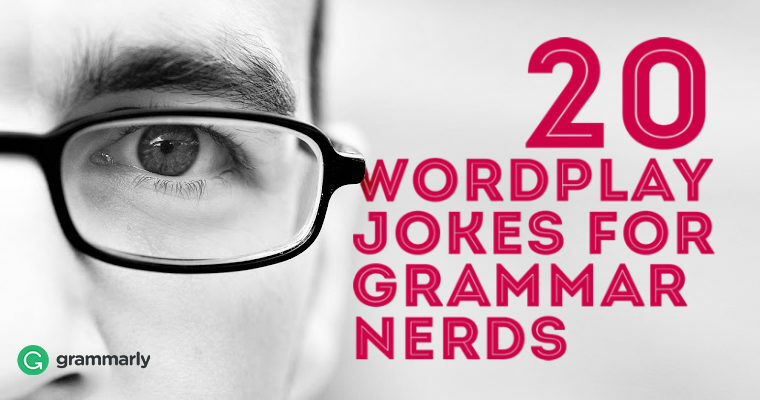 For those who aren’t the biggest grammar nerds or might have trouble with a few of the finer points, wordplay grammar jokes can be perfect for actually understanding our language. 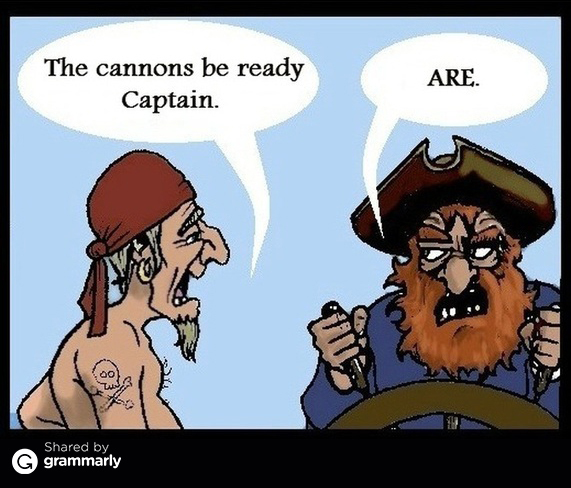 How awesome would it be if everyone had English teachers who just taught grammar through hilarious jokes? 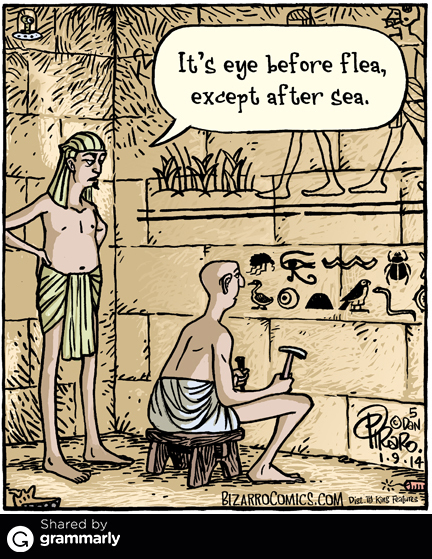 I’ve found some great grammar and wordplay jokes over the years and absolutely love each one. And today, I wanted to share some of these excellent jokes with you. Do be sure to tell me your favorite jokes in the comments; I’d love to add more to my inventory of funny. Twenty? Only twenty? Yes, only twenty. I had to cut it down to keep from overwhelming you all, but, again, you should make sure to add your favorites in the comments. 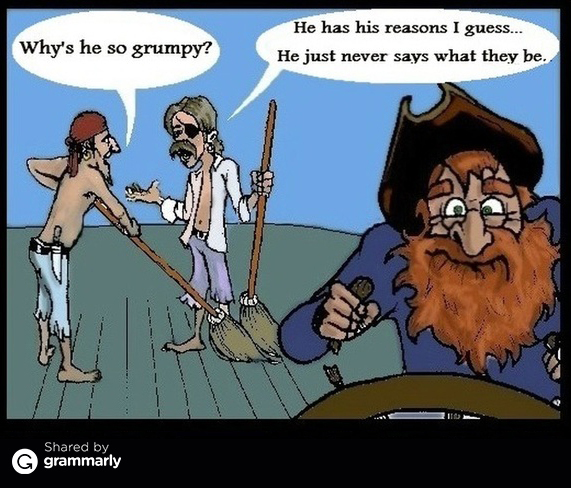 Here are some of my absolute favorite grammar wordplay jokes—some of these are pure classics and, of course, incredibly groan-worthy. 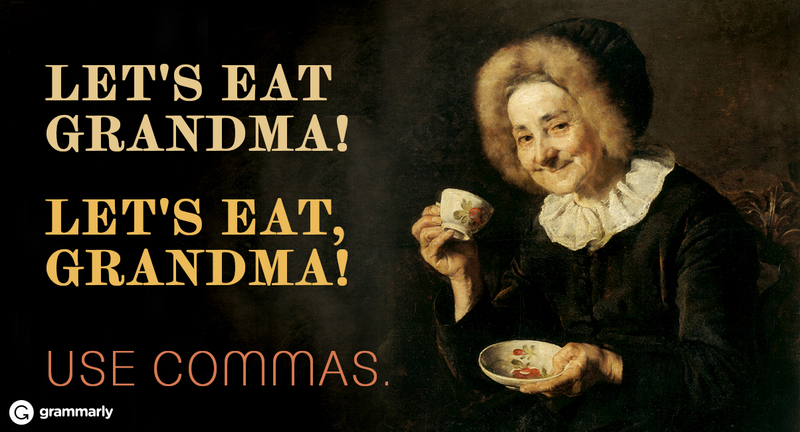 Being a grammar nerd and writer is quite a lot of fun. Until, that is, you get on Facebook and see the atrocities that people have inflicted on the English language. Don’t worry; there is a perfect way to comfort the grammar nerd in your life. But, just what do you say when comforting a grammar nerd? There, their, they’re. 2 Bars are happening places. When you walk into a bar, you know that you might just be part of a joke. Well, I once heard a story of the past, the present, and the future walking into a bar. I am sad to say that it was tense. 3 Sassy kids make the world a better place. An English teacher asked a student to name two pronouns. 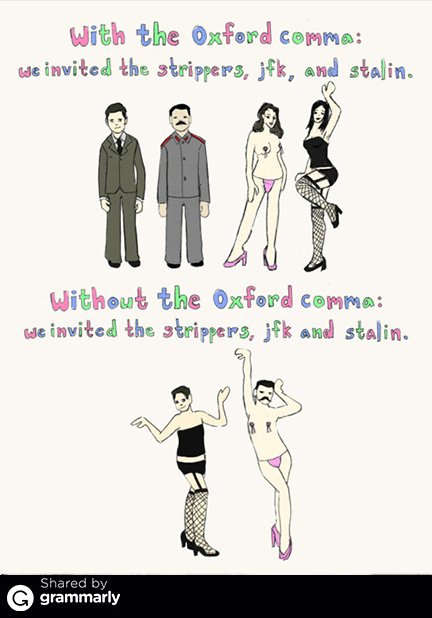 4 The ever-popular Oxford comma. Ah yes, one of the biggest debates in the grammar nerd world—the Oxford comma. Do you use it, or is it irrelevant now? Whether you are begging for baby seals to stop clubbing or wanting to eat lunch at your grandma’s house, punctuation could make all the difference. We’ve all read “Stop Clubbing, Baby Seals,” which always conjures a mental image of baby seals having a great night out. Now, if the person had written “Stop Clubbing Baby Seals,” well, so many baby seals could’ve been saved. Regarding your granny, I think she would much prefer to hear “Let’s eat, Grandma” instead of “Let’s eat Grandma!” You aren’t Hannibal Lector, or at least I don’t think you are. 6 Your least favorite word crimes, all in one spot. Last year, every single grammar nerd was ecstatic upon hearing Weird Al’s song “Word Crimes.” This isn’t a specific meme, but the jokes all throughout the video are perfect. What was his goal with the song and video? To familiarize us with the nomenclature, helping us all learn the definition of nouns and prepositions. 7 Is it arr or are? 8 That’s what she said. 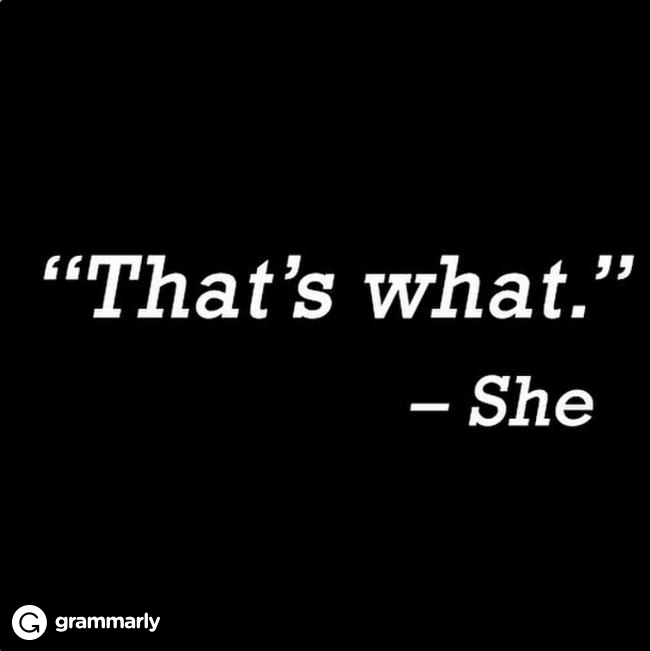 There are so many jokes that we can thank popular TV for, and “That’s what she said” is definitely one of those. This take on the classic joke is actually quite fun and something that I know writers and editors will enjoy. 9 What’s the difference between a cat and a comma? I do believe it has something to do with paws and claws. What’s the difference between a cat and a comma? One has claws at the end of its paws and the other is a pause and the end of a clause. Why do people need to make sure they don’t make typos? Well, we don’t want the errorists to win, now do we? That would be an unfortunate time for all grammar nerds. Apostrophes can cause major headaches for those who are reading a post, as well as for those who make the post. 12 What an alarming situation. Alarmed doors aren’t the happiest doors, now are they? 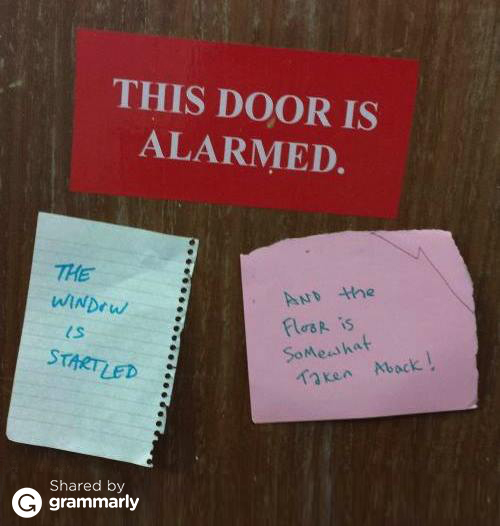 What about startled windows or somewhat taken aback floors? When Christmastime rolls around each year, we talk about Santa Claus and his helpful elves. But, what should we really call Santa Claus’s elves? I do believe Subordinate Clauses would be a great new name. Don’t you agree? 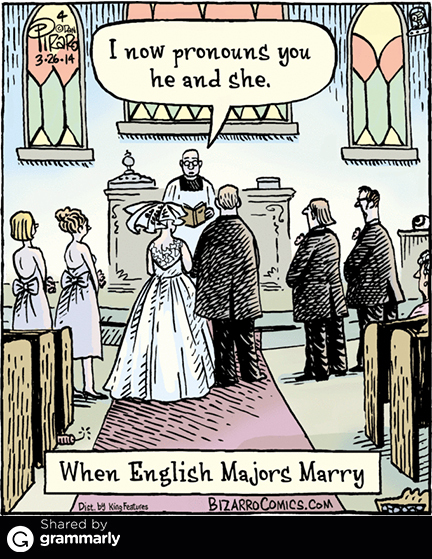 14 What happens when grammar nerds get married? 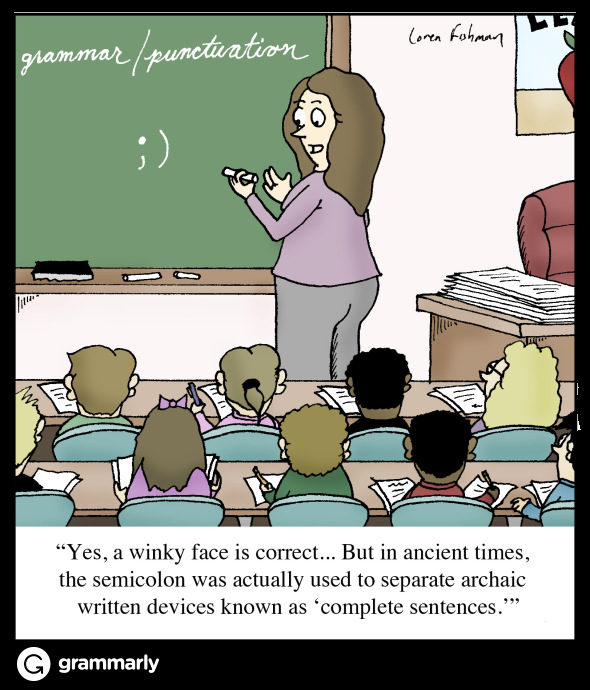 In this day and age, we have tons of kids who think that the semicolon and parentheses are only useful as emoticons. Can you imagine just how fun English class must be for all English teachers? 16 Eye before flea except after sea. 17 This knock-knock joke will knock your socks off. Ah, a joke worthy of Sherlock himself. Try this out next time you want to tell an amazing grammar joke at a party or get-together. Knock knock. Who’s there? To. To who? It’s to whom! It’s sure to be a hit. 18 Again, punctuation means everything. Just with a few tweaks, a sentence can go from one meaning to another. Is it “A woman, without her man, is nothing” or “A woman: without her, man is nothing”? 19 What is the meaning of this? The next time you hear someone yell out “What’s the meaning of this?” make sure you answer cleverly. As we all know, the meaning of this is: it’s a pronoun. 20 Your welcome and you’re welcome. 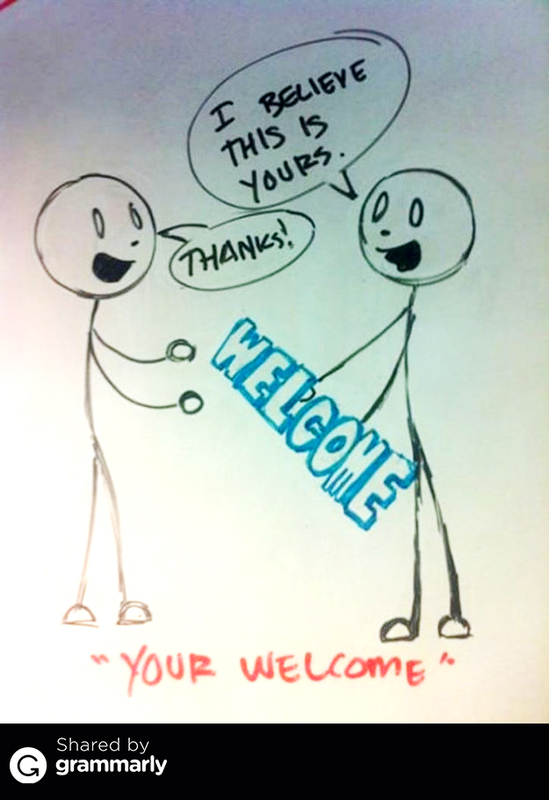 A great way to help people differentiate between “your welcome” and “you’re welcome” is to hand them a “welcome” each time they write “your.” Do You Have Great Grammar Wordplay Jokes? Give Us Your Best Shot Aren’t these all great? They are perfect to share on your social channel of choice. However, I know that I missed some great ones and want to know your favorites. Let me know in the comments so I can add more to my great collection. Heck, you could even create your own wordplay jokes and share them.